This capital of the province of the same name is one of the country's oldest, with its first origins dating from the Roman period, when a castellum called Trajectum ad Rhenum was built. After that it became a major Frisian, and later Frankish, town. In 696 Utrecht became a bishop's see. From here the conversion of much of the country began. The city was chartered in 1122, had its greatest prosperity in the 11th and 12th centuries, but throughout the Middle Ages it remained the most powerful and important town in the northern Netherlands. Until the 16th century, when it lost this position to Amsterdam, it was the largest city of the northern Netherlands. 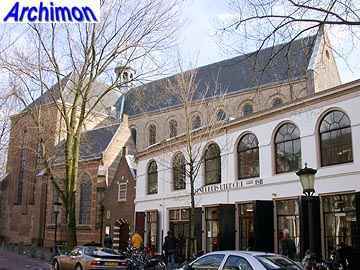 Behind this Renaissance facade is one of Utrecht's oldest churches, the St. Jan. This originally Romanesque church was part of a cross of churches in the center of which was the cathedral. 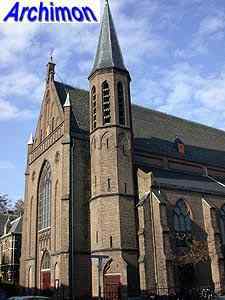 The Pieterskerk or Walloon church in many ways is the St. Jan's twin. Not only are both churches practically equaly old (both were consecrated in 1048), originally they must have looked virtually the same too, both being cruciform churches in early-Romanesque style. Of all Romanesque churches in Utrecht the St. Pieter is the best preserved, both outside and inside, even though it has had some changes in Gothic style, and its two towers were destroyed centuries ago. The St. Marie (Church of Mary) must have been a fine example of Romanesque architecture, but unfortunately after its demolition in 1813 all that remains of it is the cloister. 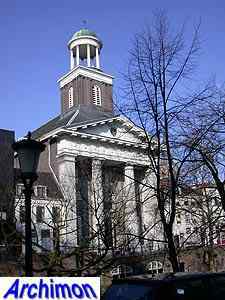 The Nicolaikerk is one of Utrecht's original four parish churches. This is a late-Gothic church with a few Romanesque parts, especially at the western facade, a reminder of the original church from the 12th century. One of its two towers was heightened in 1586 to accomodate a carillon. Of the cathedral little more remains than the tower, which always stood seperately from the main building, the transept and the choir. A storm destroyed the nave in 1674. Still, what is left is huge and very impressive. 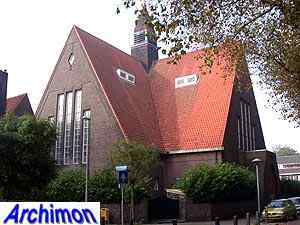 This is the only church in The Netherlands built in the original French Gothic style, all other Gothic churches in the country belong to one of the many regional variants. 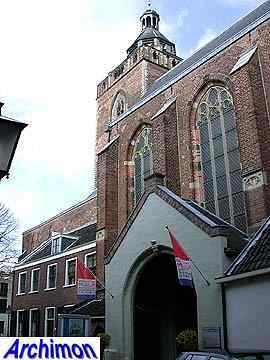 The Buurkerk ("citizen's church") until 1125 was the only church available to the citizen's of Utrecht, with all other churches reserved for the clergy only, hence the name of the church. The building nowadays houses a museum of organs. 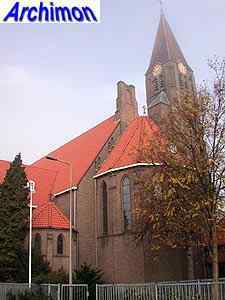 At a small distance from the St. Augustinus stands a much older church, the Jacobikerk (church of St. Jacob). This is one of four former parish churches from the Middle Ages in Utrecht's center, although it has been in protestant hands long since. A noteworthy feature of this church is the row of small houses that has been built against its front. This church is the St. Catharijne. In 1853, when the catholic hierarchy was fully restored in the Netherlands and the catholics had given up their demands for the return of the big cathedral, this church was chosen to be the new Roman Catholic cathedral. It was the only church restituted to the catholics in this city, and it was drastically enlarged by architect A. Tepe, who reconstructed the facade a few meters from its original position, and added the tower, in many ways a copy of that of the townhall of Kampen (Ov). 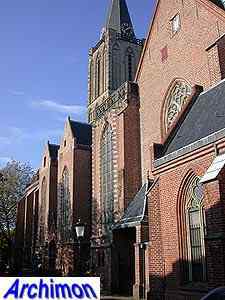 The Geertekerk is a three-aisled Gothic church with Romanesque elements. This church almost fell victim to the intolerance of the reformed, who no longer used it but preferred to see it fall apart rather than to return it to the catholics. For many years it was a total ruin, until it was decided that the remonstrants were allowed to buy it. This facade in Louis IV-style, designed by Jan Cloppenburg and built in 1745, belongs to the Lutheran church. Part of this church is the former chapel of a convent which was build here in 1412. This Romajn Catholic church, the St. Augustinus, was designed by K. Zocher and built from 1838 to 1840. It's built in a neo-Classical style that is often called Waterstaat-style, after the ministry that was responsible for the building of new churches for much of the 19th century, although the term neo-Grec is also used, and seems more appropriate, as the style is obviously inspired by ancient Greek temples. The former Remonstrant church. Before the remonstrants took over the medieval Geertekerk they used this building from 1886. It was designed by F.J. Nieuwenhuis in neo-Romanesque style. The St. Willibrorduskerk is a remarkably tall neo-Gothic catholic church. This was the only way to make the church really noticeable, as it was built on a small piece of land which was closed in by other at three sides, the only free side being a narrow alley. The church was designed by architect A. Tepe, and dates from 1876-1877. With the attraction of the traditional christian churches at the people decreasing there are often two things one can do with churches that become superfluous; either demolition or giving the building a new usefull destination. In this case this former catholic church, architect A. Tepe's St. Martinus from 1901, has been rebuilt into apartments. The St. Antonius van Padua was designed by J.Th.J. Cuypers and J. Stuyt and was built in 1902-1903. This neo-Romanesque church was the first Roman Catholic church in decades that was built in Utrecht and was not in neo-Gothic style. Utrecht's third cathedral, the Old-Catholic St. Gertrudis, dates from 1912-1914 and was designed by E.G. Wentinck. 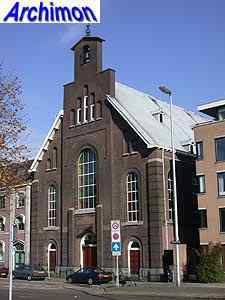 The Old-Catholic church owes its existence to a conflict in the Roman Catholic church in The Netherlands in 1702, when the church was still illegal. Since that year, after a conflict about the appointing of bishops, a part of the Roman Catholics, mainly in the provinces of Utrecht and Holland, no longer recognized the authority of the pope, and choose their own bishops. 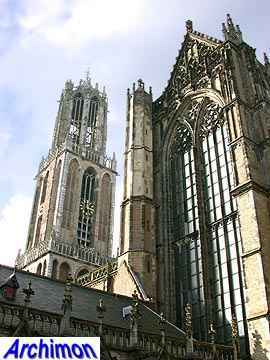 This is the cathedral of the Old-Catholic bishop of Utrecht. To emphasize the difference with the Roman Catholic church, and in memory of the former St. Marie, this church was built in the Neo-Romanesque style. The Roman Catholic church of St. Aloysius is a dome-church designed by H.W. Valk. It was built in 1922-1924. The building was constructed with reïnforced concrete which was covered by a layer of bricks afterwards. The former synagogue was designed by H. Elte and built in 1926, although the neo-Classical portal suggest a higher age. The Roman Catholic St. Getrudis, designed by W. te Riele and built in 192.. The St. Joseph was built in 1901 and was designed by G.A. Ebbers, a former apprentice of A. Tepe, whose style was obviously of great influence at this design. The St. Gerardus Majella is a church in Expressionistic style that was built in 1935 after a design by H.C. van de Leur. 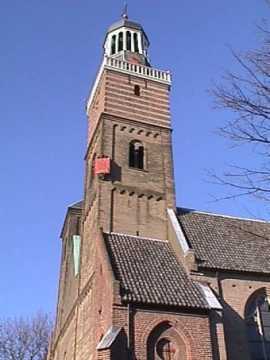 The Gereformeerde Noorderkerk was designed by D.J. Heusinkveld and built in 1922. It is in moderate Expressionistic style, like many churches of the same denomination that were built in that period. The Gereformeerde Westerkerk dates from 1891 and was designed by A. Calcoen. It is a late example of a church in neo-Classical style.